For second year in a row, Unanimous AI nails TIME prediction. For the 2nd year in a row, Unanimous AI has used its Swarm AI® technology to correctly predict the TIME Person of the Year, defying the crowd favorite represented by TIME’s own massive readers’ poll. The controversial prediction that #MeToo would win TIME’s Person of the Year is just the latest example of how Swarm AI technology can amplify the intelligence of groups. For the second year in a row, Unanimous AI has used its Swarm AI® technology to correctly predict the TIME Person of the Year, defying the crowd favorite represented by TIME’s own massive readers’ poll. On Dec 1st, Unanimous announced its top four candidates to win the often-controversial TIME Person of the Year award, indicating the #MeToo sexual harassment awareness campaign as the most likely choice, followed by Donald Trump, Kim Jong-un and Robert Mueller. Though the #MeToo campaign has unseated many powerful men, it was not the public frontrunner for TIME’s award. When the TIME readers’ poll closed on December 4th, Saudi Prince Mohammed bin Salman was the odds-on favorite, with 24% of the votes, four times as many as its nearest competitor. Last year, Unanimous made headlines when its Swarm AI technology predicted that Donald Trump, not Narendra Modi, would win, despite Modi’s having won the TIME readers’ poll handily. The controversial prediction that #MeToo would win TIME’s Person of the Year is just the latest example of how Swarm AI technology can amplify the intelligence of groups. In this case, a group of 60 randomly selected adults were able to converge on a prediction, moderated by AI algorithms, that was significantly more accurate than the large-scale poll run by TIME Magazine, which included tens of thousands of voters. This was not a surprise to researchers at Unanimous, as Swarms AI systems generally outperform polls by a wide margin. You can read more about this phenomenon in an academic paper from researchers at Unanimous and Oxford University, which analyzes the swarm’s amplification of intelligence. Swarm Insight®, Swarm® and Swarm AI® are trademarks of Unanimous A.I. and may be registered in the United States and/or other countries. Any other trademarks or registered trademarks mentioned in this release are the intellectual property of their respective owners. Unanimous AI is a Silicon Valley company that has pioneered a new form of AI aimed at amplifying human intelligence, rather than replacing it. 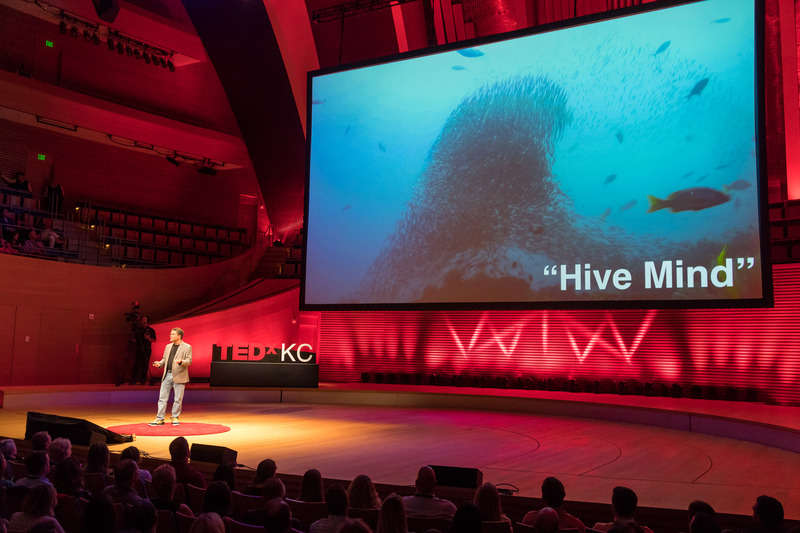 Louis Rosenberg, Ph.D., founder and CEO of Unanimous AI, presents to the sold-out crowd of more than 4,000 attendees at the ninth annual TEDxKC event.